We are so proud of our stage host and entrainment coordinator ‘Jazmin’ who for the past four years has worked very hard in the background to ensure we have a full and diverse mix of live entertainment on the Plymouth Pride Stage. We are delighted that not only is she already working on this year’s entertainment line-up that will showcase local singers, musicians, and bands. 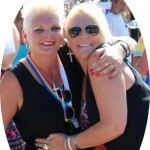 Jazmin will also duet with Plymouth 80s Diva Jo James on the Pride Stage building the 80s theme to welcome the fabulous Hazell Dean to the stage for Plymouth Pride 2016.